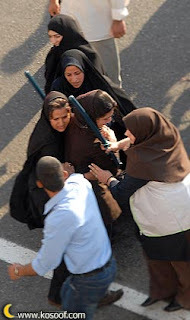 Islamic Republic continues violating human rights code by arresting many women's human rights advocates ! Human Rights comittee of the Organization of Iran's " Danesh Amukhtegan" in a statement protested to the summoning of Ms. Fariba Dawoodi Mahajer member of the council for policy making of this organization and also sentences for Ms. Susan Tahmasbi , Ms. Azadeh Forghani and other summoning of women activists. The statement also read : These women activists were practicing their peaceful activities for " Women and Men Equality Rights " , and because of their civil rights activities they were faced with harsh sentences by the judiciary. On that note Ms. Fariba Dawoodi Mahajer was sentenced to four years imprisonment( She has to serve one year in prison and the other 3 years is a suspension sentence). According to her lawyer she was chrged with " joining a gathering and helping to commit a crime" . She is a women's human rights activist and the Islamic judiciary call this activity as a crime. The statement also hope that the judiciary take better step towards other women's rights activists including : Ms. Nushin Ahmadi Khorasani and Ms. parvin Ardalan.